Before school let out on the day before Thanksgiving, Miss pat gave each of the “Can Do” kids Thanksgiving jokes to share with their families . Why don’t you print out a copy of the Thanksgiving jokes and share with your family and friends? If April showers bring May flowers, what do May flowers bring? 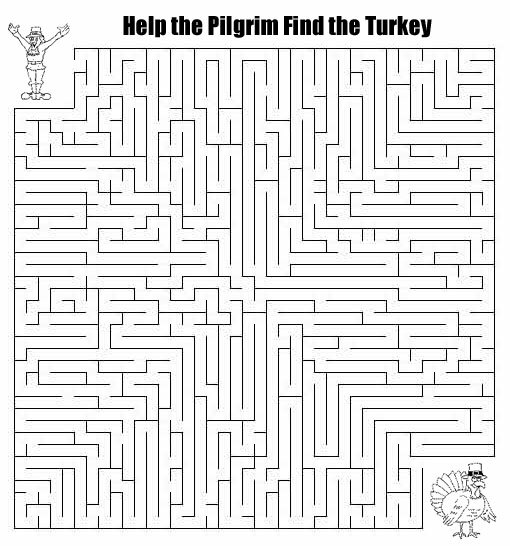 Pilgrims! Why do turkeys always go, “gobble, gobble”? Because they never learned good table manners! What key has legs and can’t open doors? What happened when the turkey got into a fight? He got the stuffing knocked out of him! Waddle I do if you don’t open the door? What did the Turkey say before it was roasted? Why did the police arrest the turkey? They suspected it of foul play! Can a turkey jump higher than the Empire State Building? Yes. A building can’t jump at all! It was the chicken’s day off! What’s the key to a great Thanksgiving dinner? What sound does a space turkey make? What’s the best dance to do on Thanksgiving? How do you keep a turkey in suspense? I’ll let you know next week! Because they use such fowl language! Why did the turkey play drums in his band? Because he already had drumsticks! Who is not hungry at Thanksgiving? The turkey, because he’s already stuffed! What did the turkey say to the turkey hunter? What’s blue and covered with feathers? A turkey holding its breath! How do you send a turkey through the mail? Why didn’t the turkey eat dessert? What do you get it you cross a turkey with an octopus? What are the feathers on a turkey’s wings called? Why did the turkey sit on the tomahawk? What’s the best way to stuff a turkey? Serve him lots of pizza and ice cream! If the Pilgrims were alive today what would they be most famous for? What type of music did the Pilgrims like? 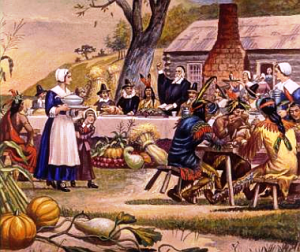 Why did the Pilgrims eat turkey at Thanksgiving? Because they couldn’t fit the moose in the oven! How did the Mayflower show that it liked America? When the Pilgrims landed, where did they stand? When did the Pilgrims first say “God bless America”? When they first heard America sneeze! Why did Johnny get such low grades after Thanksgiving? Because everything is marked down after the holidays! Where did the first corn come from? What’s the best thing to put into pumpkin pie? What vegetables would you like with your Thanksgiving dinner? Should you have your whole family for Thanksgiving dinner? No, you should just have the turkey! What smells the best at a Thanksgiving dinner? What always comes at the end of Thanksgiving? When does Christmas come before Thanksgiving? Miss Pat decided to use the coming Thanksgiving holiday to teach a history lesson about life in the American colonies. She invited Jay, since he is an American Indian, to tell the story of what the early colonists ate at that first Thanksgiving meal. “Hi,” said Jay. ”What I am going to tell you about today I learned from reading and listening to the History Channel on TV. 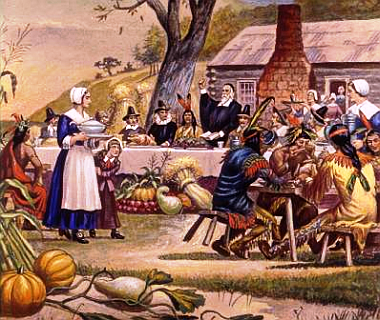 What did the Pilgrims and their Native American guests eat that first Thanksgiving day? Well, lots of what they called fowl caught by hunters. There were ducks and geese eaten on the first Thanksgiving. Historians don’t know for sure if they had wild turkeys. They may have. If the Pilgrims had cranberries, they would not have been sweet. Colonists didn’t start to boil cranberries with sugar for another 50 years. They didn’t have potatoes either. The colonists were not growing white or sweet potatoes back then. They didn’t have sweet pies for dessert since they didn’t have butter and flour for pie crust and there was very little sugar for pie filling. Miss Pat looked around the room. While the “Can Do” kids were quiet, they didn’t look very energetic. In the morning they had a math test. Right after lunch they took a spelling quiz. They were tested out. Time for something just for fun. 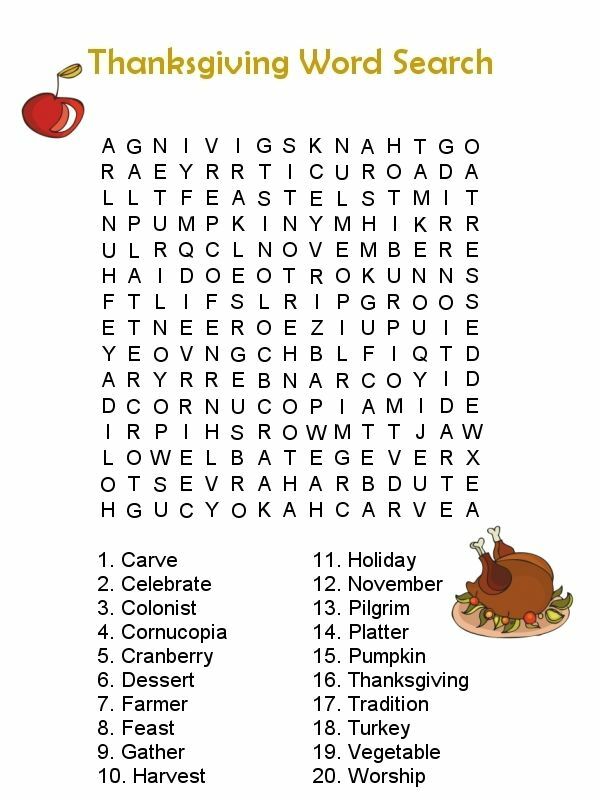 ” Class,” said Miss Pat,” time to start thinking about Thanksgiving.” With that Miss Pat handed out a maze and a word jumble with a Thanksgiving theme. The “Can Dos” got right to work figuring out the maze and finding the words in the jumble. Just for fun, print out the maze and jumble and see how you do. The “Can Dos” were still excited about their annual trip to the zoo on Friday; they especially enjoyed visiting their favorite animal house – the monkey house. Some of the class had drawn pictures of what they saw, others had pictures they took in the monkey house. Miss Pat had everyone arrange their seats in a circle and announced the rules of the “Monkey Facts” game. Each “Can Do” would take a turn stating a fact they discovered about monkeys. She would go around the circle until there was only one “Can Do” left in the circle who still had a fact they could share about monkeys. He or she would be the winner of the Monkey Facts game. A group of monkeys is called a troop. In the wild, monkeys spend most of their time in trees. Monkeys can live to be over forty years old in captivity. There are over 200 different kinds of monkeys. A monkey can weigh anywhere from four ounces to one hundred pounds. Monkeys peel their bananas and don’t eat the skins. A monkey can use his tail in the same way as his hands and feet. An ape does not have a tail but a monkey does. There are laws against bringing monkeys or apes into the United States or Canada. Well, surprise, surprise, Orrie didn’t win…Maria did! The “Can Dos” were thrilled as they used the puzzle to create a picture of a monkey! Okay boys and girls it’s your turn to play the monkey puzzle. Just go to the “Can Do” Club House, choose more games, choose monkey puzzle and put the pieces together that make the monkey picture. There is an easy version and a hard version…good luck! There are lots of fun things going on during the holidays. Your house may have decorations, plants, and foods that usually aren’t around the rest of the year. Some of these holiday items can be dangerous for your pets and you can help protect them. A definite no-no for pets, especially dogs! Cats love to play with shiny tinsel and ribbon, but if swallowed, tinsel can get tangled in their stomachs and make them very sick. If you have a cat, don’t decorate with tinsel and pick up the ribbons after gifts are unwrapped. Lots of families like to have poinsettias, holly, or mistletoe around the house for the holidays. Most pets won’t bother with them, but these plants can make animals sick. If you see your pet eat one of these plants, have an adult call a veterinarian to find out what to do. During the holidays, you may get small toys or toys that have small pieces. Some pets, such as dogs and cats are curious. They like to put things in their mouths. They don’t know that this can be dangerous. Remember to put your toys away when you are finished playing. You may want to give your pets some table scraps from the holiday meal, but when animals eat fatty foods, it can make their stomachs upset. It is best to only feed them foods meant especially for pets.Dogs love turkey, chicken, and steak bones, but they can be sharp and cause cuts inside a dog’s stomach. Make sure bones go in the garbage and not in your dog. Did you know chocolate and some sugar-free mints and gum can make dogs very sick? Don’t leave candy where dogs can get at it. If your pet eats chocolate, sugar-free mints, or gum, have an adult call a veterinarian. It is fun to give your pet treats for a stocking stuffer, but even pet treats can cause problems for animals. Some treats can get stuck in a dog or cat’s throat. Too many treats may make them sick. If you want to give your pet a treat, keep the treats small and don’t give them too many at once. Even though dogs and cats have fur to keep them warm, pets left outside for too long in the cold, without shelter, could be in danger. On days when it is very cold, make sure your pet is somewhere safe and warm. You are currently browsing the blog archives for November, 2014.